Please enter the recipients first name & surname name (22 characters/spaces max). This name will also be used for the embossing, if you choose that option. Add a message (optional) on the certificate inside the book (150 chars max - 5 rows of 30 characters). The inside cover fully personalised with the recipients name and a message. The recipients name gold embossed on the front cover (optional). The exhilarating and nail biting moments of F1 from 1958 as told in the newspapers of the time. The triumphs and tragedies of Hawthorn, Clark and Senna. The unforgettable champions such as Graham Hill, Stewart, Lauda, Hunt, Mansell and of course Schumacher, Vettel, Button and Hamilton. Read about the racing legends and their moments of glory, all through newspaper coverage written by reporters who were present at the races at the time. 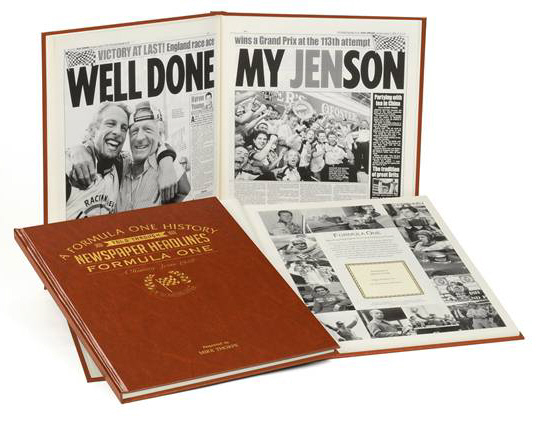 This book is a perfect personalised Formula One gift for a racing fan! To get a flavour of what the book offers Formula One fans click on this link (PDF file, opens in a new window) to view the contents of the book. The papers are reproduced from scans of (mainly) original Daily & Sunday Mirror newspapers going back over a 100 years that are stored in our extensive archive.They are individually printed to order onto a high quality thicker paper to provide greater durability.